The Kirra Surfriders Club 2014 Open Club Championship round 1 will be held at D’bah beach on Sunday 5th January 2014, sign on by 7.30am for 8am start (QLD time). The 5th of January 2014 will also be the sign on day for all new members as well as for existing members to renew their memberships for 2014. The three open club championship rounds to be held during 2014, are open to open age surfers who in the opinion of the Contest Committee have the necessary skill to compete at this level. The top 4 ranked Juniors from the 2013 pointscore will also automatically be included along with other invited participants as chosen by the Contest Committee. An independent Surfing Australia accredited Judge will be the head judge for the day. 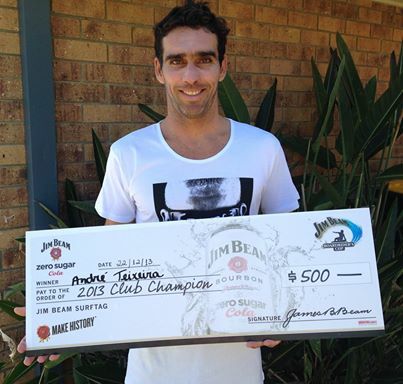 The winner of the Kirra Club Championships (best 2 of the 3 rounds held across 2014) will also receive $500 and will represent the club at the Jim Beam Boardriders Cup Australian Final to be held in 2015, where they will compete against surfers from more than seventy Boardriding Club’s from NSW, QLD, WA, VIC and SA, with the JBBRC Australian Champion winning additional money and prizes.